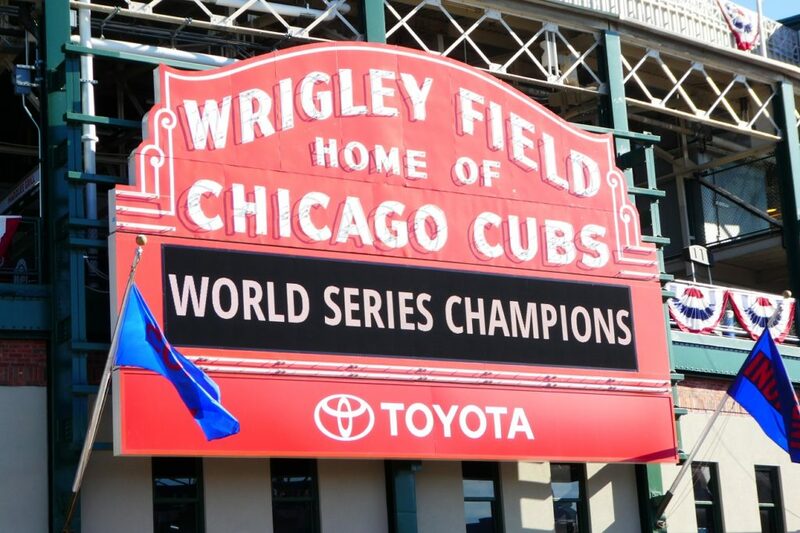 Photo by Jamie Bartosch/Suburban TravelingMom The famous Wrigley Field sign is a popular photo op, especially now. 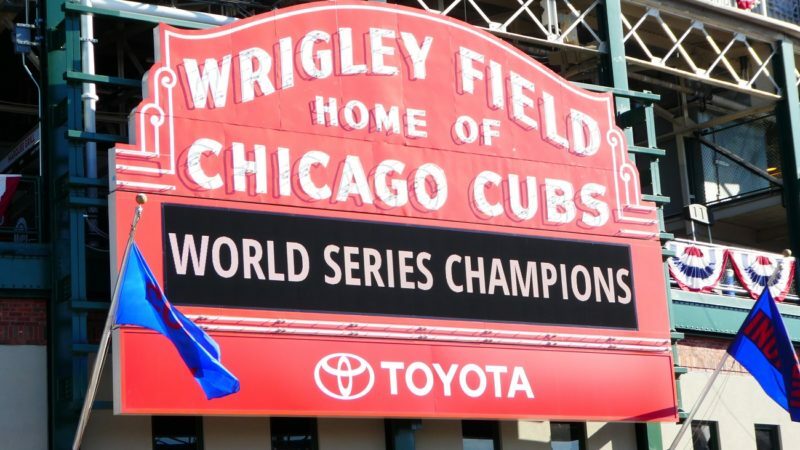 If you’ve ever watched the Chicago Cubs on TV, then you’ve seen fans celebrating in Wrigleyville, the neighborhood on Chicago’s north side that’s home to the Cubs’ ballpark, Wrigley Field. While Wrigleyville is a hard-partying area filled with bars and rowdy fans, there are still fun things to do with kids there. It’s gonna get even more family-friendly soon, because the Cubs owners plan to add an ice rink and family movie nights. This is a must-do. The red sign, on the corner of Clark and Addison, has been in front of this historic ballpark since the 1930s. 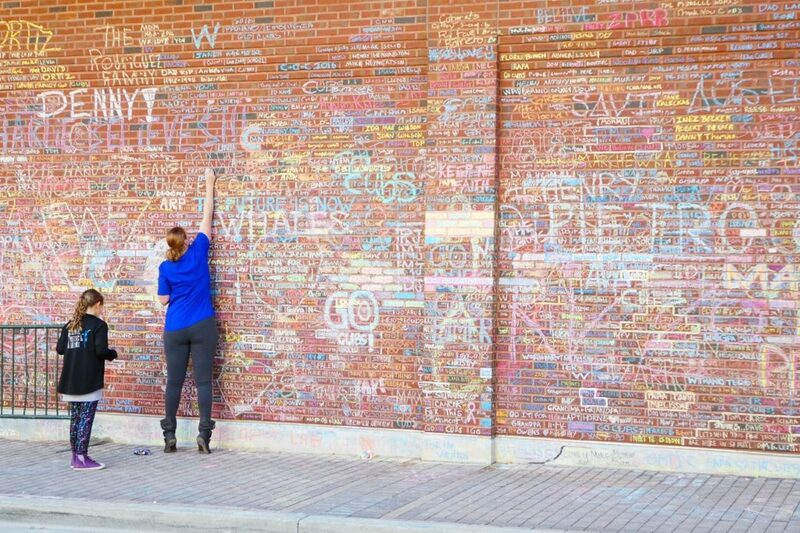 People use chalk to sign the walls of Wrigley Field. This nice, new park space adjacent to Wrigley Field opened in the spring 2017. Families can sit on the lawn and watch games on the big screen, play catch, buy food at the new restaurants lining the park, or take photos with the 2016 World Series trophy (free!). On non-game days, the park hosts a farmers market, movies, fitness classes and more. Before games, or when the Cubs are out of town, you can go on a 75-90 minute tour of “the friendly confines,” as the ballpark is known. The tour includes all sorts of history and fun facts, and takes you into the press box, the visitor’s clubhouse, the bleachers, and onto the field. See this link for details. See the 103-year-old ballpark’s manually operated scoreboard in center field and the ivy-covered brick walls in the outfield. Listen to a live organist play rally chants. Sing “Take Me Out to the Ballgame” during the 7th inning stretch, and “Go Cubs Go” after the game (if they win). Keep score the old school way – with a paper-and-pencil scorecard. Eat hot dogs, peanuts and Cracker Jack (or my kids’ favorite, the chocolate malt cups, sold by the vendors walking through aisles). Run the bases, which kids ages 13 and under can do following Sunday afternoon games. Watch the 2016 World Series Champions play! 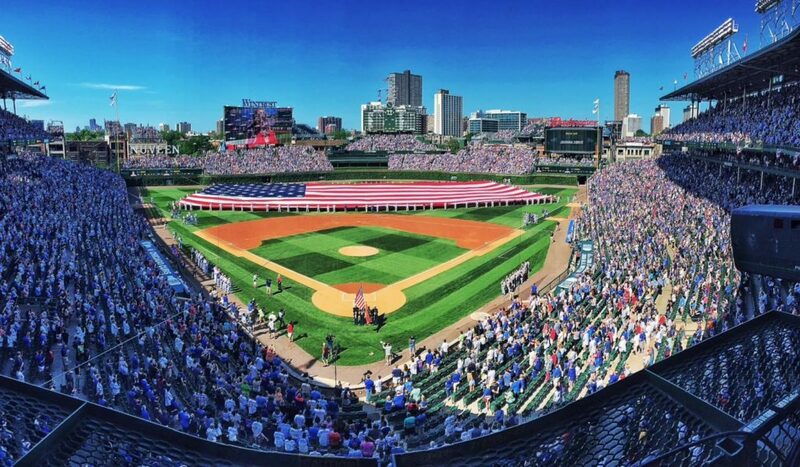 Wrigley Field on Memorial Day 2016. Save money by bringing in your own bottled water and snacks, like bagged peanuts, which can be purchased from vendors outside Wrigley on game days. Bottled water inside the park is $5.25! You might be able to get autographs from players if you go early, during batting practice. Go to the Club Box wall on the outfield-side of the dugouts. Batting practice ends 45 minutes before the game begins. In the men’s bathrooms, large troughs are used as urinals. They’re disgusting (I’m told), but also a famous part of the ballpark. Something to keep in mind for the men in your group. The second floor of Sluggers sports bar, a block from Wrigley Field, is filled with skeeball, batting cages, pop-a-shot and arcade games. Kids are allowed up there, although I wouldn’t recommend it on game day. There’s great shopping at the huge souvenir shops across the street from the ballpark. A popular item is a white “W” flag, which is the Cubs “win” flag. In pre-cell-phone days – and when most baseball games were played in the afternoon – Wrigley Field would raise a W flag on the scoreboard. That way, people commuting home on the Red Line train (which runs right past the ballpark) could see if the Cubs had won that day. It’s very old school – and very Chicago. Uncommon Ground is a great family-friendly restaurant in Chicago’s Wrigleyville neighborhood. There are many good restaurants around here, but not all of them are kid-friendly. 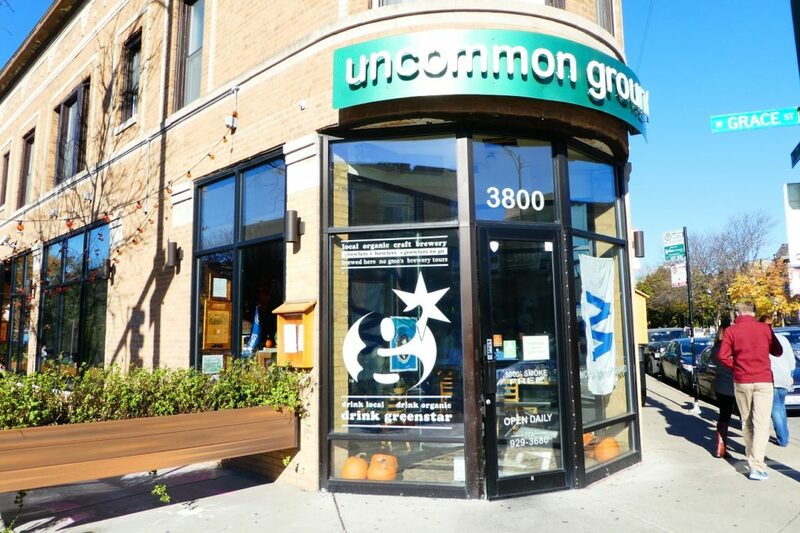 One of my favorite Wrigleyville restaurants for kids is Uncommon Ground. The organic “contemporary comfort food” is excellent, and it’s in a friendly, cozy, coffee shop-like setting. Just on the outskirts of Wrigleyville are two other great family restaurants: Crosby’s Kitchen, a place known for its rotisserie chicken and warm skillet cornbread and cookies; and Milt’s Barbecue for the Perplexed, an upscale, kosher barbecue place that donates all of its proceeds to local charities. Note: It is closed every week between 2pm Friday and 11:30am Sunday, in observation of the Jewish Sabbath. For candy, nuts or a tin full of Chicago popcorn (a cheese and caramel mix), go to Nuts on Clark. There are special World Series tins available now. 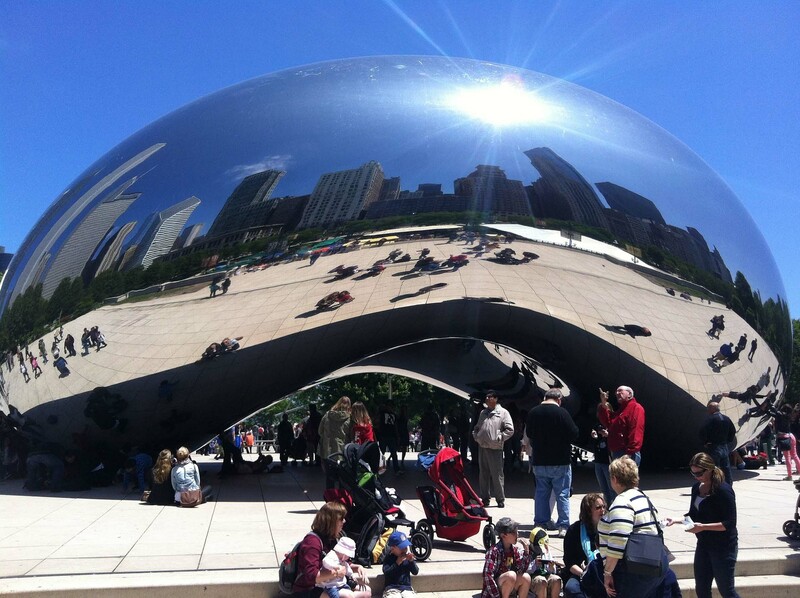 For other kid-friendly restaurants around Chicago, see a list of 17 of my family’s favorites. I think it would be great to eat at Wrigleyville restaurants. I have a hard time with feeding my kids everytime we travel. 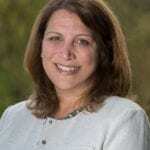 It is great to hear that Chicago has a nice kid friendly hospital. My wife and I are going to our first game ever at Wrigley, on Saturday July 7(2018), when our hometown Cincinnati Reds come to visit for a 3 game weekend series. I’m already stoked about going. Do you need game tickets to access the new park? No, it’s just a big open park area called Gallagher Way. Here’s the website with more info: https://www.gallagherway.com/ You need to reserve a time to see the World Series trophy, which you can do online.